The organising team was headed by Dr Benedict Valentine Arulanandam. Other members of the organising team consisted of Ms Prema Selvarajah, Ms Chitra Devi Ragunathan and Ms Alagarani S.A. Suntharam. The students blazed in early that morning in good spirits and smartly dressed in business suits. At the foyer, they were warmly greeted and presented with cerulean VU goody bags by Dr Benedict and Ms Chitra Devi. Ms Prema and Ms Alagarani eagerly awaited the arrival of the students in the Graduate Centre Hall 2 (GC2), the main venue of the event. Ms Alagarani, who was the emcee for the event gave a quick introduction to the Bangalore guests. This was followed by the first event on the program which was ice-breaking games organised by the Sunway CPA Australia Student Charter (SCSC) members in Function Room 2. The students were divided into four teams. The students played two games. The games were the ‘Alphabet Game’ followed by the ‘Blanket Name Game’. The students’ natural exuberance and competitive streak soon filled the Function Room with sounds of riotous excitement. The session ended with a simple prize giving ceremony to the winning teams followed by a group photograph. Next, the students were ushered back to GC2 for a musical treat by the Sunway University Ensemble’s string quartet. The violinists captivated the visitors with their soothing classical music. A rousing applause ensued as the performance drew to an end. 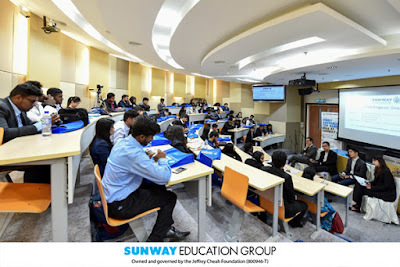 The students were then treated to lively video presentations produced by the Sunway Education Group and the Victoria University Business Club. Starting off the VU Programmes Showcase, the VU Undergraduate Programme Director Ms Greeja De Silva welcomed the students with the traditional Indian greeting of “Namaste / Vanakkam”. She highlighted the VU Undergraduate Programme’s unique feature of imbedding generic and employability skills into the curriculum through the three Business Challenge Units which our students undertake throughout their undergraduate studies. She alluded to Sunway’s history of collaboration with Victoria University, the VU undergraduate course structure, pointed out its established track record and touched on the majors currently offered which includes the two newly introduced Management & Innovation and Supply Chain & Logistics Management. She also spoke about ‘what students experience’ and ‘what employers want’ before concluding. Dr Hendry Ng, Director of the VU Postgraduate Programme provided a short discourse on current trends driving postgraduate study. His central idea was that “emerging businesses are disruptive and technology driven”. He suggested that this was specifically why the students would want to do a VU Masters as it provides the combination of business and technology know-how necessary to take advantage of the current business trends. 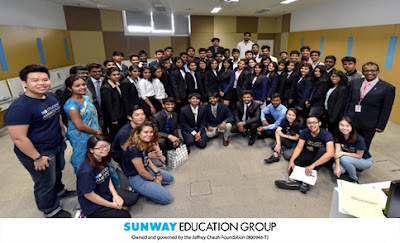 After the showcase, the students were then escorted by staff from the Sunway International Office on a campus tour. The students were given time to walk and explore facilities offered by the campus. Among the places that were highlighted were the Canopy Walk, Library, Level 2 Computer Labs, Jeffrey Cheah Auditorium and the newly refurbished Cafeteria. The students even stopped to admire the hip-hop dance being performed by students at the front of the New University Building (NUB). Throughout the day, the students had the opportunity to taste food from Malaysia and interact with VU programme staff while eating their mid-morning snack, lunch and tea. After lunch, the students reconvened at GC2 for a Dialogue entitled “21st Century Trends and Challenges – Leadership role by Youth of Today.” The Panel consisted of Mr Samuel Kim, President & Co-Founder of Centre of Asia Leadership (CAL), Mr Richard Ong, Founder of Lollipop Lab and Petalz and Mr Clayton Tan, General Manager, Head of Human Resources, KLK Oleochemicals Group. The panel was moderated by Dr Tong Gin Chee, Head, Strategy & Management at the CAL. The panel amongst others discussed the compelling global workplace trends and important mind set, personal values and skills youths of today need to possess. The students were also given the chance to ask the panel members questions and learnt about the impact of freelancing and move towards informal work units as opposed to working for big corporations, growing emphasis since 2007 on attitude rather than aptitude as well as the importance of values such as integrity. All in all, the students found the dialogue very impressive indeed. The students were then transported to the Sunway Group Headquarters where they were briefed on Sunway Resort City by Mr Goh Hai Thun, General Manager – Property, Property & Facility Management. Mr Goh highlighted many interesting features of the Bandar Sunway township and also presented the Sunway Corporate Video and introduced the Sunway City Sustainability Initiatives which includes landscaping, vertical gardens, rainwater harvesting, water treatment plant, shuttle bus service and traffic management. He also mentioned the introduction of new animal and plant species into what was once disused mining areas and Sunway City’s certification by the Green Building Index (GBI). As a conclusion to the visit, the students were met by Dr Elizabeth Lee, Executive Director of Sunway Education Group. In her speech, Dr Elizabeth Lee recalled fondly of her travels to India. She drew similarities between St Joseph’s College and Sunway College’s mission. 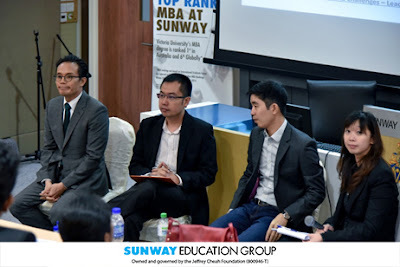 She mentioned that one of the plus points for Sunway was the international events and conferences it organises which provides its students with the opportunity to assist in the organising of the event while interacting with academicians from top universities such as Harvard and Oxford University. The visit drew to a close with a speech from Dr Christo explaining the purpose of the visit and Ms Greeja’s closing speech. The highpoint towards the end was a speech from a representative of the St Joseph students and a short performance as a gesture of appreciation to Sunway. The organising committee then joined the visitors for tea, which marked an end to the official visit. The St Joseph’s students had a good time as evidenced by their solicited comments. Notable comments include likening the Sunway campus to a mall and praise for having friendly and approachable lecturers. The visiting students also credited the VU Programmes as ‘amazing with opportunities to move over to VU’ and the VU Masters (ERP) programme for being internationally recognised with good job opportunities.